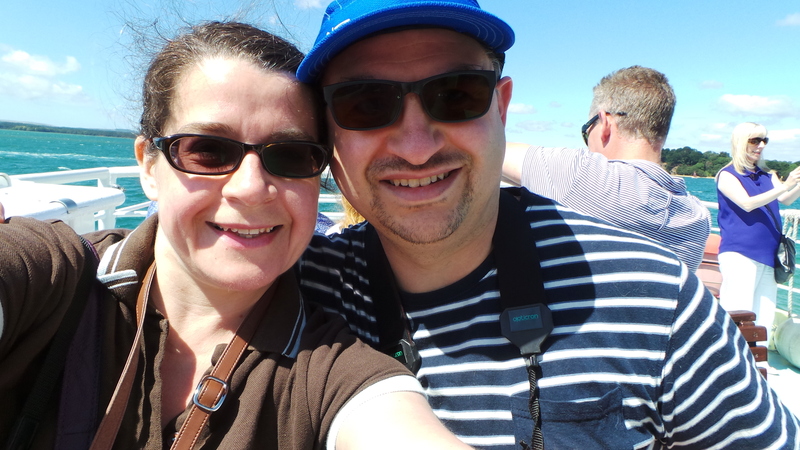 Catching up hurriedly with my book reviews after my flurry of seaside reading (well, mainly reading on the lovely long train journey there and back – roll on the 5.5 hour journey to Cornwall later in the year!). In other news, I’ve set up a page for my #20BooksOfSummer challenge now, because I was confusing myself when I was trying to check where I was up to. Visit it here – and it will be updated with links and the last little list when it’s time to post that. The sixth book in the Forsyte Saga finds the horrible situation that was brewing in the last book and especially its interlude coming back to bite Soames Forsyte, still the central character, still going strong. Poor old Michael Mount, devoted husband to Fleur, finds the political system he’s previously espoused untenable and is looking around for a new cause, having been told that you have to have a noticeable “cause” to get on in politics – and he’s finding that people are only interested in politics when it directly affects them (funny that – I sense a theme). Then his wife Fleur finds out that her first love, Jon Forsyte, although devotedly married himself, is back in London, and she can’t help scheming to see him (and more, something which I think I missed in my first reading of the books in my teens!). Meanwhile, Soames is worrying about inheritance, trying to work out a successor to his faithful old retainer at the firm that still handles a few family trusts, and gets a new interest in tracking down the family ancestors, even taking a trip down to the ancestral lands to trace the graves of the original Forsytes. Things must come to a head, of course, and there’s a genuinely moving scene at the end (how had I forgotten it? I suppose I’ve read a few books since I last read this one in 2008 (my wisp of a review is here)) when Soames casts aside the prudence and carefulness of a life of habits and inflexibility just at the right moment … but is it too late? This is a cracking read; I think my co-readers of this series agree that it’s better than the previous volume in this trilogy. Ali’s review is here and Bridget’s is here. I’m taking a short break now, and will start the last three books in September. This book will suit … I will say that really you have to have read the other books in the series to get the full value out of this one and understand all the references and minor characters. The series as a whole will suit anyone interested in the 20th century, its history and politics. One of a small haul I bought perilously close to Christmas, on the grounds that no one was likely to buy me the first volume of Tony Benn’s letters and papers as a Yuletide treat. And I was correct. It did take me a while to get through this one, as there was a lot to it, and in small print, too! It covers the years 1940-1962, so there are interesting (and sad) details of his wartime life and then his entry into politics, and it finishes with the horrible situation when his father dies, he inherits his peerage and then has to be barred from sitting in the House of Commons – then a long battle to change the law to allow people to rescind their inherited peerage, which got VERY detailed, although the points where he actually engaged physically with The System and represented himself in court were excellent. It is a good read on the whole, with an engaging and caring author. It was a bit uncomfortable to read about my hero, Nye Bevan, from the point of view of a sometime opponent of his, and I did get a little bogged down as I’m not that familiar with the history and politics of the late 50s and early 60s. What made the book for me, although a little bittersweetly, was the air of plus ça change, plus c’est la même chose about so much of the content. The Labour Party is in disarray and split along left / centre lines. Young people are sick of the parties and demanding an alternative choice to vote for. The Labour Party must remain the party of the working class and not split from the unions. How interesting that we are still hearing all of this 60 years later (or depressing, of course). There are lovely flashes of humour, too – for example a description of the way to get two teas at a Buckingham Palace garden party (nip in at the start when everyone’s looking at the Royal Family arriving, and do the same at the end), and it’s nice to see people like Flanders and Swann pop in. I also loved the support he drew from his wife. So an interesting if challenging read. I’m not sure whether I’m going to read all of them (certainly the final volume is meant to be quite distressing, as he realised this would indeed be the final volume). This book will suit … people interested in mid-century politics and history; people interested in the Labour Party and the Left in general. Currently reading – funnily enough, given that I was reading it yesterday, I’m still reading “Our Hearts were Young and Gay” by Cornelia Otis Skinner. If I get these reviews written up speedily enough, I might just finish it before Mr Liz gets home. I’m not sure what’s next – I really should make a start on the scary Iser book on reader response theory, which will help towards my poor languishing research project, too … but I opened it the other day and know I need to sit down with a notebook and a set of post-it tabs to read it properly. Hm. Well, I’m not sure that these books have very much in common, apart from the fact that they were both registered on BookCrossing (although one was acquired a while ago and the other more recently), and they were slimmish paperbacks. And both of these reasons meant that I took them to read on our recent long weekend jaunt to the seaside, as they packed well, and I could leave them behind and make more room in the suitcase. The third in the amusing Mobile Library series, and I’ve either become more tolerant or they’ve got better, as the few issues I’d had with the previous volumes (follow the links for reviews of Book 1 and Book 2) were resolved and it was just an entertaining and fun read. Israel Armstrong, north London Jewish librarian marooned in Northern Ireland running a mobile library van is trying to resign from his job, yet again, but then there comes the opportunity to attend a mobile library conference in England, aka a free ticket back home! First he has to persuade his partner-in-library-van, Ted, to go, too, and only then can he look forward to the chance to see his mum and his girlfriend, Gloria. But his mum’s moving on with her own life, and gets on better with Ted than with her own son (in some hilarious scenes) and then Gloria seems strangely unobtainable and distant. To make matters worse, the library van then goes missing, and there’s a madcap search across several counties, peppered with interesting and weird characters and situations, with a side visit to an uncle of Ted’s who is not quite as he seemed back home. It’s funny with a melancholy undertone, and there are some places where it’s a bit un-PC (but those who are less modern in their thinking are criticised for it). I’m looking forward to reading the next instalment. This book would suit … someone with a slightly silly sense of humour and a love of puns, possibly someone who’s liked Jasper Fforde although the world is not so involved and is rooted in the real world. I love Gardam, but I think I prefer her novels on the whole, as there’s more to get into. These are very well done stories, however, and excellent character studies, with the slightly odd situations and characters that I love in this author’s work – some nuns taking a colleague to the hospice see a strange wild cat; an elderly woman thinks of the ghosts of her young children when sitting on a bench in a wood, etc. The story “Bevis” is more characteristic of her novels that I like (I haven’t read the recent ones, but love “Bilgewater” and “God on the Rocks”), a bit longer and with a blundering teenager trying to be sophisticated and getting things wrong. Some of the stories are a little creepy, but not as much as her other volume of short stories, which has a description that puts me off on the back! This book would suit … a Gardam fan or a fan of short stories in general – not my personal favourite form. Currently reading – I’m currently loving “Our Hearts were Young and Gay” by Cornelia Otis Skinner, recommended by Simon from Stuck-in-a-book and loaned to me by Heaven-Ali. Two more reviews to come soon, as I’ve finished my sixth John Galsworthy and have also finally finished Tony Benn’s “Years of Hope” (which is on my #20BooksOfSummer list, as is the Otis Skinner). I’m doing quite well with my #20BooksOfSummer now – I’ve just finished the 6th book of my first 8 and I’ll probably be hopping over this weekend to make a start on my next one from the new pile (see below!) as it’s time to dig out some Trollope on the Kindle. I’ve really enjoyed the fact that it’s “made” me pick books off the side-piles that I’ve developed around the TBR, so I’m picking out another of those to add to the new list, plus some that a good friend has lent me (she also told me about this challenge, so it makes sense). So, here are the next six books. And yes, I haven’t finished 7 and 8 yet, but I’m nearly there and it’s nice to have something to look forward to, right? First up, Anthony Trollope’s “Doctor Thorne”. My Trollope reading isn’t a challenge, but I do want to make sure I pick him up regularly as I so love the books of his I’ve read so far. “British or American English” – this is the last book on my side pile of “work books” and reflects directly on the work I do. It’s been languishing for ages, so time to pick it up! 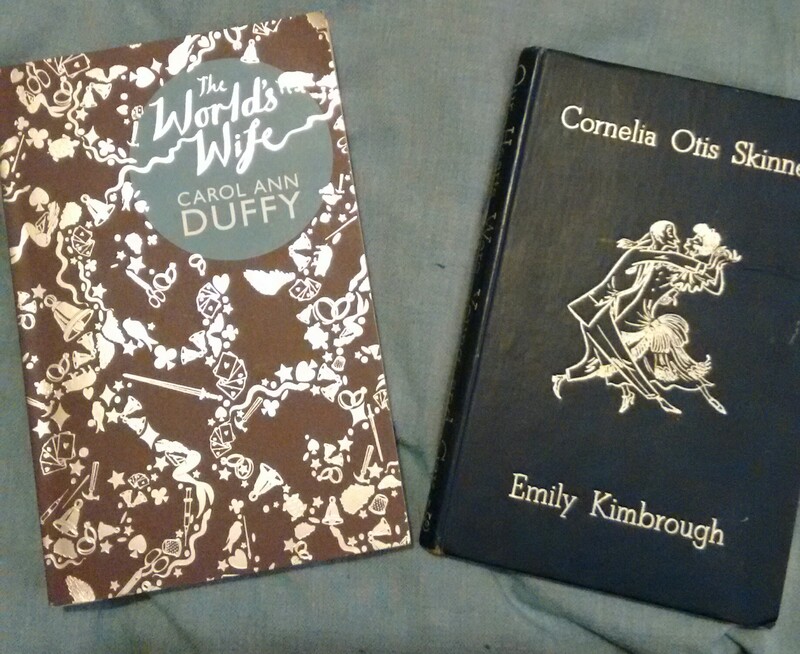 Carol Ann Duffy – “The World’s Wife” – I don’t read much poetry but I like Duffy’s stuff and this is a set of poems about the wives of famous historical characters / people from myths, etc. and looks funny, subversive and clever. “Our Hearts were Young and Gay” by Cornelia Otis Skinner – excitement has been whipped up by Simon at Stuck-in-a-Book and Ali bought, therefore I can borrow. This is a book about Skinner travelling with a friend and looks very fun. Now, I should read all of my lovely loans this summer, but I should pick something off the TBR, too, so my last three are these. “Unbridled Spirits” by Stevie Davies is about the women of the English Civil War and was given to me by my friend Laura. Dervla Murphy’s “Through Siberia by Accident” is the first of my Christmas books, from the Birmingham BookCrossing Christmas do, and anything by this author is always worth reading. And finally Ursula le Guin’s “Tales from Earthsea” – I’ve read all of her Earthsea books and this is short stories to accompany them. These should take me up to 15, with 5 Viragoes and Persephones to choose from in August. Can I do it? I hope so! 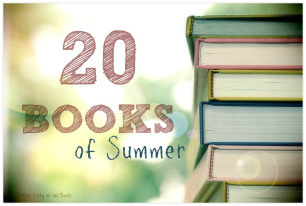 Are you a #20BooksOfSummer reader? How are you doing with the project? Two books which don’t have much in common except that they’re by favourite authors of mine. 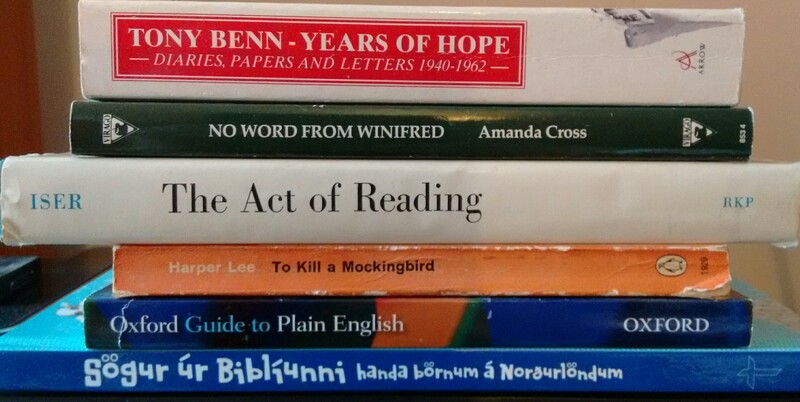 And book 5 in my #20BooksOfSummer challenge – except that doesn’t look much like “To Kill a Mockingbird”, I hear you cry … find out why the swapsie (I hope I’m allowed to do a swapsie) after the reviews! The second part of the Salterton Trilogy but can also be read as a standalone. This novel takes us into the worlds of small-town legal relationships and newspapers, as someone plays a naughty trick on two young citizens, stirring things up with a small ad. Professor Vambrace is up in arms and threatens a lawsuit, even though his daughter, Pearl, shrinks from the idea. Gloster Ridley, the paper’s editor, has to deal with the professional “character” on his staff as well as running the paper and batting away the lawyers, all the time guarding a secret that he doesn’t realise everyone else knows. Meanwhile, the locuses of power are in people’s homes and beds, not in the traditional hierarchy. Ladies’ luncheons are hotbeds of icy comments and double meanings, while Dutchy and Norman Yarrow, a professional entertainer and a psychologist, think they have command over people’s actions and minds, while instead just forcing their fellow city-dwellers into highly resented silly party games. Although perhaps not as marvellous as “Tempest Tost”, the shrewd and often very funny observation of small city life is all there, beautifully observed, and there are characters to make you squirm, terrible parental figures to make you shout at your book and lovely characters to care about. This book will suit … people who like novels about small towns, fans of quiet wit and observation with the odd bit of slapstick thrown in for good measure. Two novellas in one volume, both more than ‘just’ romances, as they inhabit attractive and realistic worlds and communities while sticking to the tropes of their genre, thus cleverly gaining a wide audience. In “Marriage Wanted”, a wedding planner meets a divorce attorney and so sparks are contractually obliged to fly, although I was a bit bothered by some of the terminology used around the heroine, Savannah’s, leg injury which we don’t really see in the UK any more. A touching tale of a marriage of convenience turning to affection and some nice details about Savannah’s shops (anyone else REALLY like books about running shops?). “Lone Star Lovin'” has its backdrop drawn in more satisfactorily, with Sherry joining best friend Norah in Texas, but keeping to a small town rather than the big city, where she soon meets the requisite rugged cowboy … plus his 12 year old daughter. Her teens and smaller children are well drawn, and so are her portrayals of small-town characters and female friendship. This book was number 5 in my #20BooksOfSummer challenge (replacing “To Kill a Mockingbird” for reasons explained underneath). This book will suit … people who like their romance more community orientated or their town tales romantic. OK, I’ve thought long and hard over this – but I’m not going to write a long piece. I was all set to re-read “To Kill a Mockingbird” then read the ‘new’ Harper Lee, “Go Set a Watchman”. But I’ve read some pieces and reviews as the book’s come out and been serialised, and I’ve realised that I just don’t want to. I don’t like the lack of clarity around the author’s intentions (and normally I claim not to care what the author thinks or says particularly, but the gossip and the possibilities have been unpleasant). And I don’t want to have a hero diminished (I’m reading that Atticus Finch is not the man he became in TKAM) and a book I have loved for years without re-reading it diminished, too. There is the thought that as an editor, I would enjoy seeing what was in the original book that became TKAM, but do you know what? No. So, I’ve put TKAM to one side, not ordered or pestered a friend for GSAW, and that’s how it’s going to stay. 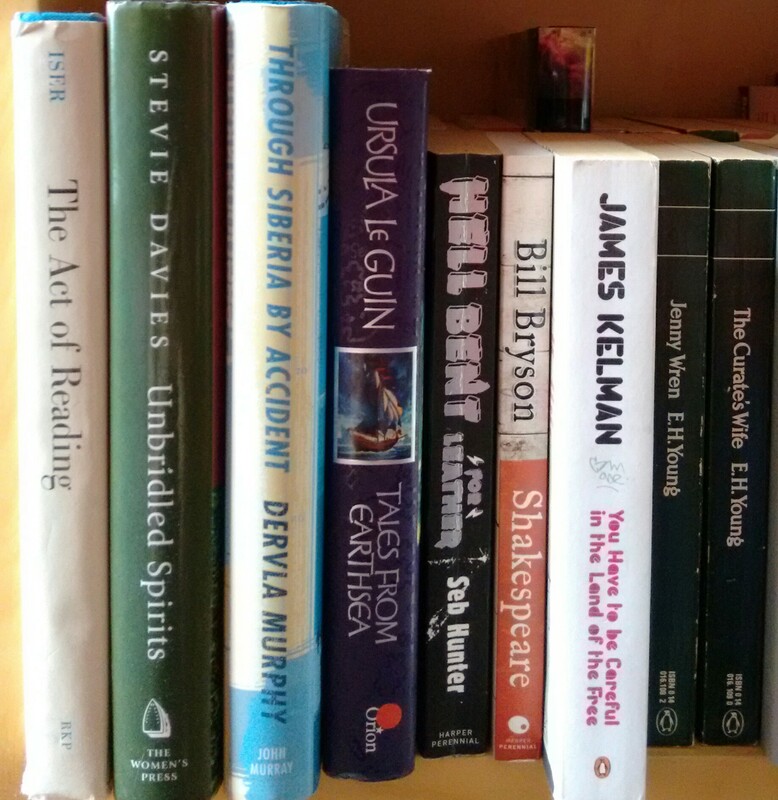 Here we go with books 3 and 4 in my #20BooksOfSummer challenge – I will admit to being a bit worried, as some of the upcoming reads are NOT on the list, but enough are that I should be able to do it by early September. And I’m really glad that I’m doing both this challenge and my own on-going Reading a Century challenge, because if I hadn’t been doing those, I probably wouldn’t have got back into Arnold Bennett (I have read something of his before), and that would have been a big shame, as he’s my new author obsession now! Amanda Cross is the pen-name of Carolyn Heilbrun, renowned humanities professor and feminist scholar, and her academic background shines through in this engaging Virago Crime novel about a professor of English and part-time detective. Her feminist credentials are displayed through the many strong women evident throughout the book and controlling its progress, although she’s no separatist, and the protagonist, Kate Fansler’s, marriage is shown as strong and supportive, and beautifully drawn. The novel plays with literary characters (I definitely spotted references to Mary Renault) and the tropes of both campus and crime novels while exploring the disappearance of the enigmatic Winifred, who has always been a bit of a loner and a mystery; while the women’s lives are seen as texts by Kate, they are also presented in different texts, so we get diaries and letters as well as narrative and dialogue – all very nicely done. And the story is a good enough one to stand on its own, too. I particularly liked the scenes set around the MLA and at conferences, and the casual mentions of the New French Feminists (the book was published in 1987). There’s even a reference to my research interests, when someone says that the lives of authors have to be studied in books on their works nowadays, “not like the New Criticism days when people weren’t supposed to have lives, or to have put them in their work”. 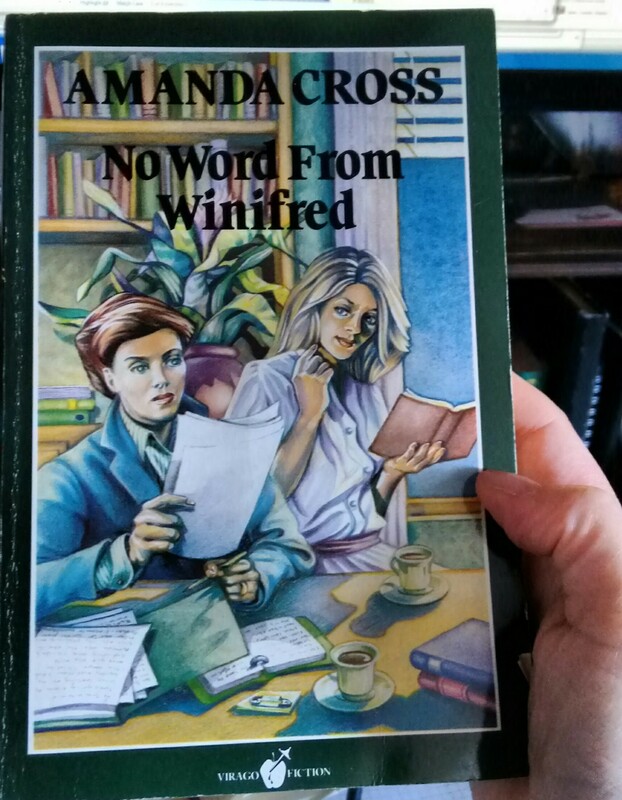 So, a very good read, which reminded me of “Oxford Exit” and how I need to read the others in that series – this one is part of a series, too, and Amanda Cross is definitely going on my wish list! This book is the third read in my #20BooksOfSummer challenge. This book will suit … people who like their crime to gloss over any possible gory bits, and enjoy something with an academic background. Bennett’s “These Twain” is the 1916 book in my Reading a Century project – fortunately or unfortunately, that’s the third in the Clayhanger series. So I have to read “Clayhanger” and “Hilda Lessways” before I can even get to that one (and “The Roll-Call” after than), but that’s FINE because I have another author obsession to add to my later-in-life loves for George Eliot and Anthony Trollope (hooray!). This is a lovely and absorbing account of life in the 19th century Potteries (the towns around Stoke-on-Trent, given fictionalised names here), centring on Darius Clayhanger’s printing business and the growth to manhood of his son, Edwin, met at the beginning on his last day of school and left coming up to 40 with a lot changed and a lot still the same. The lives of the Clayhanger family, which also includes sisters Maggie and Clara and their dead mother’s sister, a bit of a Terrible Aunt, are intertwined with those of the Orgreaves, the father of whom is an architect, and Edwin’s in particular with Hilda Lessways, a friend of the Orgreave family, although he learns to lean towards self-education, architecture and book collecting from the family as a whole. The web of community that George Eliot portrays so beautifully is evident here, with strong secondary characters drawn from the employees of the printing works through to the vicar and doctor siblings with their mealy ways. And like Trollope, Bennett is essentially humane, with a strong regard for social justice and interest in the position of women – especially, here, unmarried daughters. Indeed, the portrayal of a timid man pushed to locate the extremes in his character could be drawn as a theme from Trollope, too. There are some uncomfortable moments in the novel where Edwin is nearly brought to violence, but this is clearly delineated, I think, as the result of some parts of his character being under-developed then flowering out suddenly, which does not seem to be A Good Thing. This was book 4 in my #20BooksOfSummer project. This book would suit ... Anyone who likes a good story, a web of relationships, a tale set firmly in its geographical and social milieu. I’m currently reading Tony Benn’s memoirs, which will be Book 5 of the challenge, and I’m going to go on to the next Forsyte Saga book, to finish off the second of the three trilogies. 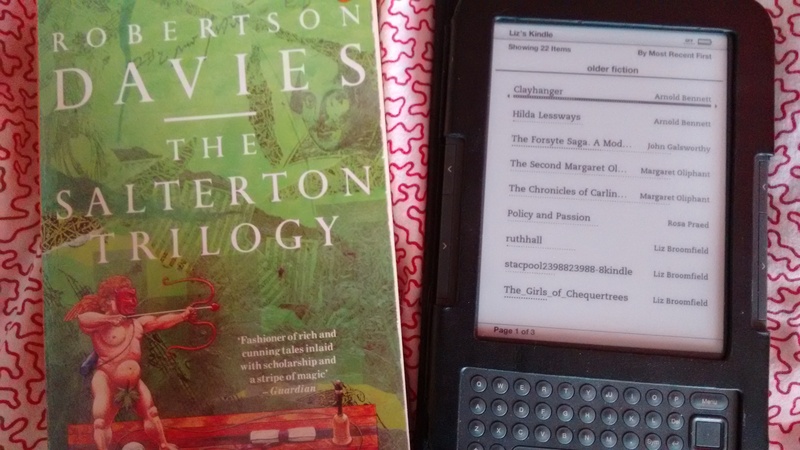 Then it will be another Robertson Davies and perhaps a new Trollope … so many lovely series and obsessions at the moment! Well, here’s the TBR in all its glory. It hasn’t got that much smaller but it hasn’t got that much bigger. In fact, I only seem to have acquired two new books in June, which I didn’t manage to record anywhere, although I carefully took and saved a photo, so here are those two. 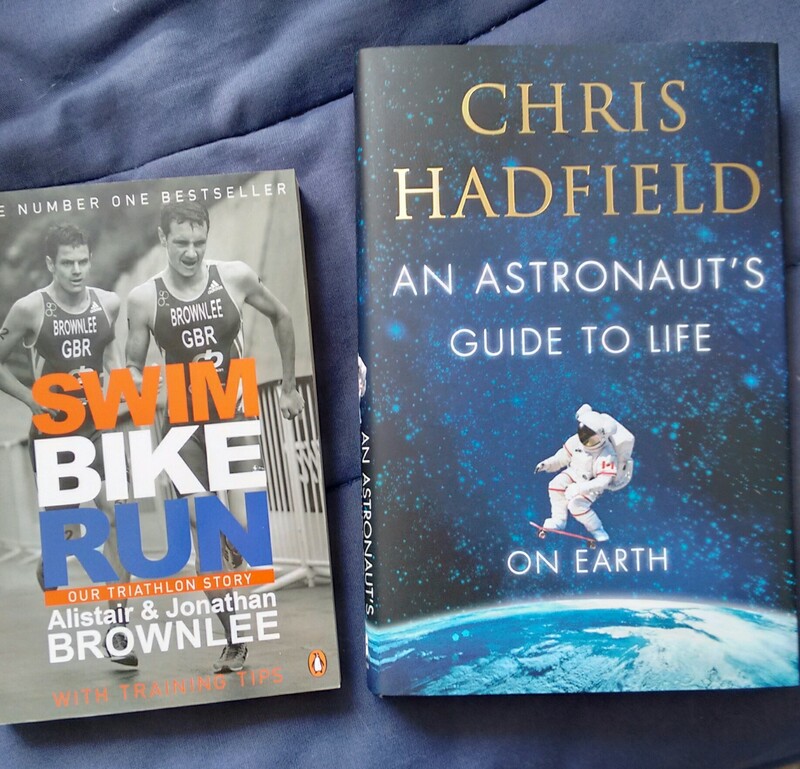 I have a thing about sports biographies (as regular readers might have noticed), and who could resist the Hadfield book? I’ve read or am reading a couple of books from my Kindle this month, and I’ve also picked at least one off the ancillary piles that hang around associating themselves with the TBR. Both of those choices have been partly inspired by the #20BooksOfSummer challenge I’m involved in, which just means picking 20 books you want to read by the start of September and reading and blogging about them. Nice to have such a simple challenge. A quick progress report on the #20BooksOfSummer project while I’m here – of the eight books I nominated for my first tranche, I’ve read three (“Patricia Brent, Spinster” and “Oxford Guide to Plain English”, both reviewed here and “No Word from Winifred”, which will be reviewed next), and I’m currently reading “Years of Hope” on paper and “Clayhanger” on Kindle. I have to say that I have a new obsession to add to my George Eliot and Anthony Trollope ones, as I’m loving Arnold Bennett and want to read All The Books. I can thank my Reading the Century project for that, as I did go searching for a book for 1916 that I fancied, and found “These Twain”, which is third in the Clayhanger series. Hooray! Next up when I’ve finished those are my next volumes in the “Forsyte Saga”, where I’ll be going on to Volume 6 (so a break next month before doing the final trilogy in September to November) and Robertson Davies’ Salterton Trilogy, which I decided to read month by month, too, in order to make it last. I also want to do another Trollope. The new Harper Lee is out soon, so Matthew and I are going to re-read “To Kill a Mockingbird” to build up for that (and that’s another one off #20BooksOfSummer, too). Once those are all done, I’ll be chipping away at the TBR again. I do want to read the slightly terrifying “The Act of Reading” as it should be useful for my (poor, neglected) research, and I’m going to skip any Viragoes or Persephones I might reach (so ignore the last two on this pic for the moment), as August is traditionally All Virago All August month in the LibraryThing Virago Group, and I think I have enough of both scattered throughout the TBR to maintain a month’s reading! That feels like a very prescribed reading pattern for this month when I look at it like that, all written down. Hm, wonder if I’ll go wild and pluck whatever I fancy off the shelves! I do have two weekend trips away, though, so that will hopefully give me plenty of reading time and allow me to get through the planned books and into the wonderful weirdities of the TBR! Are you trapped in a net of challenges or reading free this summer? And hello to any fellow #20BooksOfSummer challengers who are reading!